Cascade is a line of dishwasher detergent products including powders, liquid gels, packets, and pods because “Every pot, plate, glass, and pan has a Cascade” made for it. This was the first detergent formulated for the automatic dishwasher in 1954 by Dennis Weatherby, for Procter and Gamble. This was a radical product idea, since at the time, only 4% of US households had an automatic dishwasher. The claim was that Cascade would produce “spotless dishes and stemware” based on its sheeting action. Today, with over 60% of all households featuring a dishwasher, Cascade maintains its popularity and performance standards. From the original pine-scented, blue and green granules sold in 1955, through the first lemon scented liquid form (introduced in 1986), to today’s line of many formulas and formats, Cascade is a product leader. There are several categories of Cascade: The traditional powders in the bright green boxes (in several scents), action Pacs (in formulas including Clorox, Dawn, and Febreeze), a Platinum formula (for extra cleaning power), Complete (which dissolves baked-on 24 hour residue), Destinations (with exotic scents such as dragon fruit), and Gels (in varied sized plastic jugs). All products, as of July 1, 2010, have been phosphate free, in compliance with the governmental demands to reduce the harm to the environment when phosphates are released into ground waters. In the past few years, Cascade has substituted non-phosphate cleaners to maintain the high quality of the product and to protect the ecosystem. On the website, there are helpful hints describing additional uses for the product. Cascade can be used on stubborn bathtub rings; it can clean stubborn stains in thermoses; it can boost washing machine performance with whites. 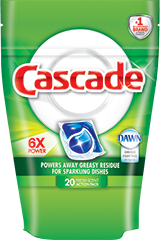 Cascade is a leading dishwasher detergent and remains a favorite choice for consumers after 60 years.